Hungry Kat: Iberico de Bellota Ham Back at Surfas! Surfas was out of cured Iberico de Bellota Ham a few months ago and I was really excited yesterday to see it's finally back. The ham is a thing of beauty to be admired in person. Surfas gets the whole leg (bone-in of course) and sets it at their deli/cheese counter to be carved to order. Surfas said they should be stocking this until March. Surfas is selling the Iberico for $135.25/lb. I got four slices which set me back $33. What can I say? A New Year's treat was in order. 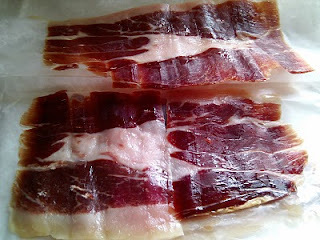 Oh, check out my first post if you want to read about cooking raw Iberico de Bellota. It was fun cooking it and even more amazing when it came to chow time. Really check out LA Espanola for Iberico jamon. They distribute to quite a few of the local stores. It's a bit far, but the Sunday paella lunch is quite fun.